A colorful new book celebrates the midcentury rise of the vinyl format and its attempt to reflect and inform modern American life. With the vinyl LP enjoying a worldwide resurgence in the 21st century, it seems as good a time as any to examine a unique period in the LP's early years when the format was a catalyst not just for entertainment, but also culture, instruction, and status. 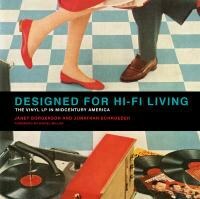 With Designed for Hi-Fi Living: The Vinyl LP in Midcentury America, Janet Borgerson and Jonathan Schroeder examine an era in the 1950s and 1960s when the LP served a variety of purposes. With the vinyl LP enjoying a worldwide resurgence in the 21st century, it seems as good a time as any to examine a unique period in the LP's early years when the format was a catalyst not just for entertainment, but also culture, instruction, and status. With Designed for Hi-Fi Living: The Vinyl LP in Midcentury America, Janet Borgerson and Jonathan Schroeder examine an era in the '50s and '60s when the LP served a variety of purposes. With this new 12-inch sonic format suddenly becoming all the rage in any typical midcentury American household with a hi-fi console, record companies from Capitol to RCA Victor to Columbia began producing a variety of album series that would help to define and cater to middle-class America and its global status at the time: World War II was over but a new (Cold) War was already upon us. With capitalism firmly entrenched and anti-communist sentiment filtering through suburbia, the LP was used to celebrate the American way of life. Consumerism. Entertaining. Travel. It was all at our fingertips, and records could lead the way, not just through the actual music contained therein, but through its colorful album art, instructive and informative liner notes, and various themes extolling the virtues of the good life. Designed for Hi-Fi Living is divided into two sections: Home and Away. Home includes chapters like “Being at Home", with illustrations and lengthy descriptions of generic-sounding albums like Cocktails and Conversation featuring Jan August at the piano; Let's Have a Dance Party featuring Buddy Morrow and his Orchestra; and even more direct instructional albums like Hear How to Plan the Perfect Dinner Party by Gaynor and Dorothy Maddox. In the chapter “Modern Art and Design", albums by many known and respected artists are featured, particularly jazz musicians such as Ahmad Jamal, Dave Brubeck, and Ornette Coleman, with modern, often abstract album art that mirrors the contemporary, often groundbreaking sounds contained in the grooves. Also featured in the Home section are collections like Columbia's Music for Gracious Living Series, which gives the typical American household plenty of musical and textual instruction on everything from barbecues to after-dance house parties to do-it-yourself house projects (there's even an album called Music to Paint By). RCA Victor's Dinner Music series includes albums dedicated to learning Italian, Chinese, French, German, and barbecue dinners, complete with requisite background music, recipes and dated, clichéd (yet colorful) artwork. RCA's Music for Hi-Fi Living series includes titles like I Could Have Danced All Night, Hits From Hollywood and A Lazy Afternoon. Whatever your mood or activity, mid-century albums provided plenty of accompaniment, predating current conveniences like YouTube and Pandora. In the Away section, there's a chapter devoted to airlines, many of which provided albums that catered to their destinations (Pan Am's A Musical Trip 'Round the World, SAS Airlines' European Holiday) and even partnerships with specific artists (Pan Am's Goin' Latin by Ramsey Lewis and the exotic-sounding Jazz Impressions of Eurasia by the Dave Brubeck Quartet, the latter featuring a cover photo of an amused Brubeck stepping off a Pan Am jet and bombarded with Pan Am carry-on luggage by local women). In other chapters devoted to subjects such as honeymoon travel and specific cultural meccas (Cuba, New York City, Europe), the idea is to paint global travel not only as an attainable escape from day-to-day life but as an unalienable right for all Americans. Life is good, and the world is your oyster. Now get those bags packed. Rounding out the book is a final chapter on a destination that was very much on the minds of the American public in the '50s and '60s: space. Dubbed by the authors as “the final frontier of our mid-century vinyl voyage", these albums were undoubtedly inspired by the Apollo space program and the race with the Soviets to conquer worlds beyond our own. Albums featured include William L. Laurence's The Conquest of Space, a “spoken arts" album that “resembles a contemporary podcast about the space race," as well as Man on the Moon: the Flight of Apollo 11, something of an audio documentary of the successful moon mission, complete with official NASA voice tapes. Space-inspired music albums are also included, such as Strings for a Space Age by Bobby Christian and His Orchestra and Music From Another World by the Jay Gordon Concert Orchestra. With this collection of “space music", Americans could not only live in the moment but also look far beyond the horizon. Designed for Hi-Fi Living is an eye-opening, colorful, often humorous look back at a time when the vinyl LP was not only becoming a commonplace item in the American home, but also reflected the times we lived in, and our hope for the future.